In recent weeks, a growing mob of “birthers” has besieged Publicious World Headquarters, demanding to see my paperwork. They claim certain irregularities in my published documents call into question the legitimacy of my right to blog. Well, to them I say, phoooey! 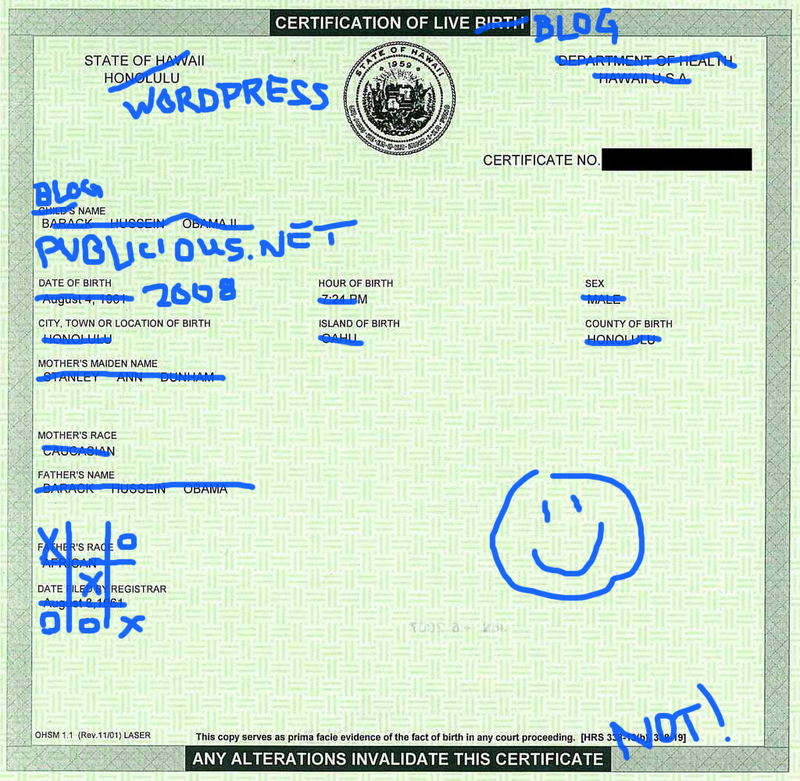 However, you the loyal readers have a right to know, so to end this controversy once and for all, I am posting a scan of my original, unaltered, notorized blog certificate. I hope this will serve to prove beyond the shadow of any reasonable doubt, that I am the legitimate owner of this blog. Feels good to get that out in the open. Now, on to the links! Some things are OMG, others are WTF, most are somewhere inbetween. Here’s the OMG-WTF Spectrum to help you sort things out precisely. New Era Cap has a fun Flash RIA for designing your own baseball cap. 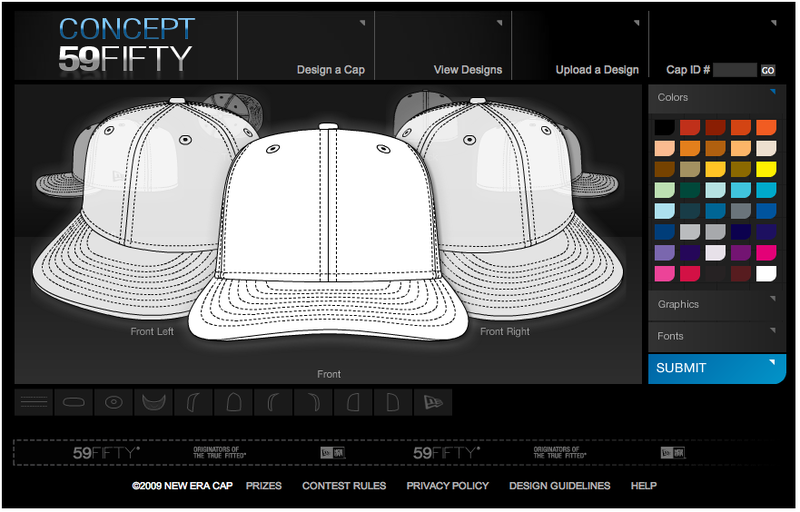 It’s also a contest and if your design wins, they’ll manufacture the cap (there goes that crowdsourcing again. lazy bastards). Anyway, if you really want to trick out your design, you can download PSD and AI templates and go to town. Speaking of RIAs, Sitepoint has the 18 Coolest AIR Apps for Designers. The Graphics Fairy has a free vintage (Victorian) clip art and a fun idea/project for the kids, making a game of concentration out of your favorite graphics. My kids would probably prefer the Creative Suite icons…or SpongeBob. Tutorial Lounge has 25 Astounding Typography Tutorials. Deke McClelland is posting a Top 40 Photoshop Features Countdown over at Lynda.com. Now that people have had a chance to use Flash Catalyst, they’re starting to uncover some glitches in the Creative Suite-RIA connection. I stumbled on an interesting post about gradient fidelity and FXG generation tools. Inkscape is a free, open source vector graphics tool (that I haven’t had a chance to play with yet). If anyone has tried it, please let me know your experience and opinion of it. Divine is a tool that gives you the ability to convert Photoshop documents into WordPress themes. Sounds interesting. too bad it’s PC only, or I’d be trying it at this moment. Digital Photography School has a basic tutorial for how to use textures to enhance photographs. Very simple technique that can yield great results. Finally, after spending the better part of a weekend like a dog chasing my digital tail, I posted the Top Ten Reasons to Quit Out of InDesign and Call It a Day (or Night). Know when to say when, my friends. That’s it. Till next time, be well, and if a birther jumps out of the bushes and demands to see your paperwork, hand ’em one of these.